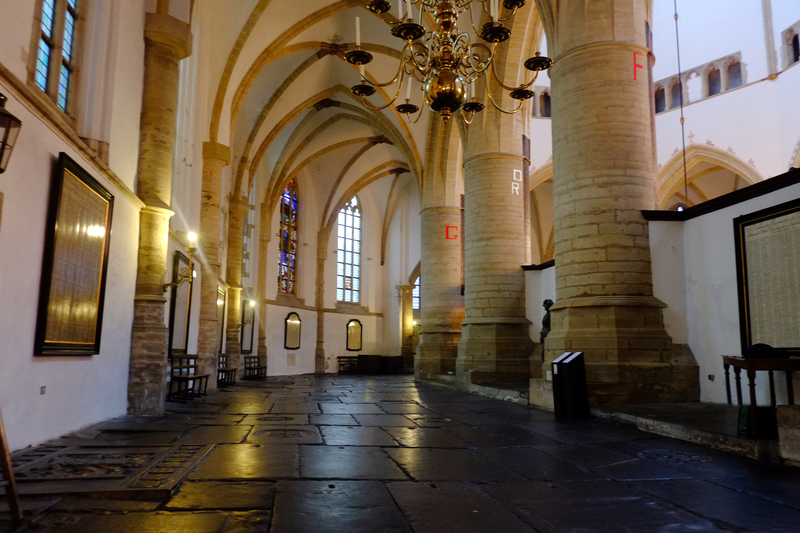 The Grote Sint-Bavo Church in Haarlem. The difference with graffiti is that her work is certainly no street art. Her projects are almost always tied to a specific place or space, to which Meester makes herself subservient. 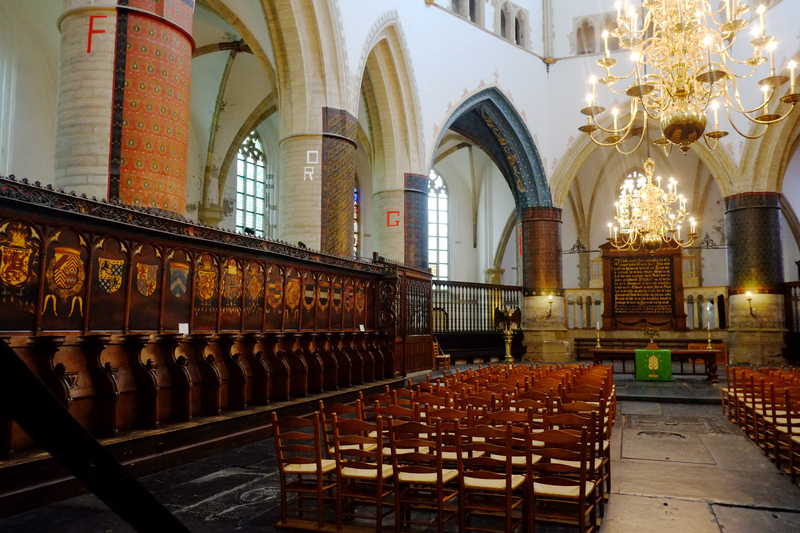 As she does in this case to the architecture and significance of the Grote Sint-Bavo Church. The text FORGIVE ME is inspired by an emotion that she recently faced in her private life and which transforms here, in the Bavo Church, into a critical reflection on the church as an institution. Even though the confessional boxes were rigorously removed from the church in 1578 during the Reformation, the concept of Forgiveness is still very much alive in the church. But what does FORGIVE ME, asking for forgiveness, actually mean? It’s just as easily said as it is difficult to do. It’s easy to ask for forgiveness in the confessional box because that’s just something you automatically do or used to do. It’s a way in which the church also appears to absolve itself from guilt. Much harder is it to ask for forgiveness face to face, outside the confessional box. Since this implies pleading guilty, saying you are sorry et cetera. 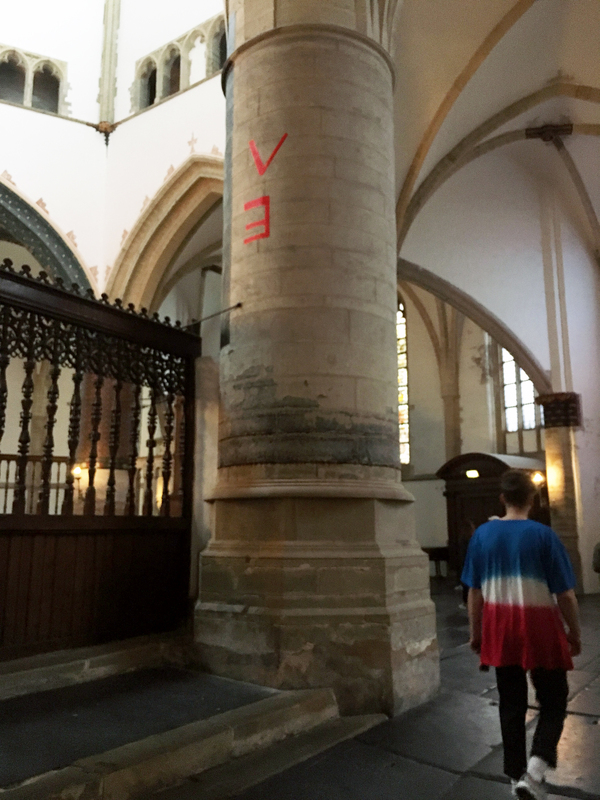 Meester applies her FORGIVE ME again and again on the pillars around the choir, as visibly as possible. It is the crucial essence of one of the seven sacraments she is applying here with red tape, showing a beautiful and subtle mixture of typical church jargon with a kind of anarchistic gesture. Using the Bavo’s remarkable architecture as an intermediary, Meester stretches the boundaries of what is customary and acceptable inside the church. But it is an act of forgiveness in itself to make both church and the public at large think about this specific concept. Nothing beats using the ancient church as a modern stage for critical reflection.